Rococo Revitalize Skin Lightening Cream claims to inhibit hyper pigmentation, eliminate skin pigmentation and disperses melanin pigment – allowing this product to deliver brighter, lighter, and more even-toned skin. However, is this the best skin lightening solution available to you? The following review will examine various aspects of this product such as formula and customer support, in order to determine if this is a wise purchase choice. 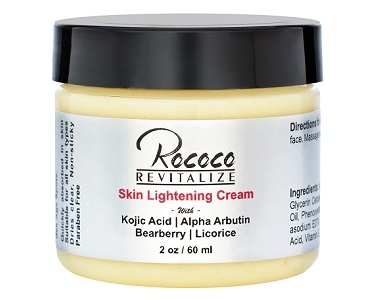 What’s in Rococo Revitalize Skin Lightening Cream? Alpha Arbutin is a natural skin lightening agent that reduces the skin’s melanin production through a process of hydroquinone release. Kojic Acid lightens the visible damage caused to the skin by sun exposure as well as scars, therefore, reducing signs of aging. Bearberry Extract is an antioxidant that protects the skin from environmental damage as well as lightens the tone and color of skin. In saying so, it’s concerning that there is not a concentration provided for this ingredient as it needs to be effectively diluted in order to deliver results without damaging skin. Licorice Root Extract is an anti-inflammatory and antioxidant that controls oil production of the skin and soothes acne-prone skin. While these ingredients may prove beneficial in delivering some skin lightening results, the lack of any patented ingredients is a concern as these are third-party tested and clinically proven to deliver results – therefore, giving customers peace of mind. Other brands on the market include up to 5 patented ingredients, such as Alpaflor Gigawhite (which brightens and evens skin tone) and PhytoCellTec Alp Rose (which protects the skin from external and aging damages). What’s more, the formula contains fragrances and colorant which may hold hidden ingredients that could be harmful to sensitive skin. There is no mention of this product being cGMP certified or cruelty-free, raising questions as to the quality and ethics of the production process. How Do You Use Rococo Revitalize Skin Lightening Cream? The manufacturer provides simple instructions on how to use this product. Simply apply a thin layer of the cream to the entire face and neck twice a day after washing the face. Then, massage the cream into the skin using a circular upward motion. 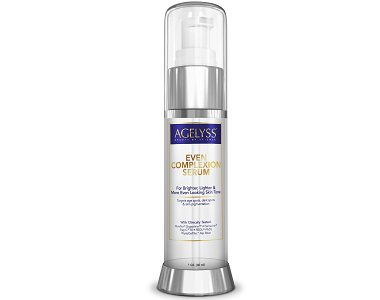 This product is claimed to be quickly absorbed and suitable for all skin types. However, the lack of the concentration of active ingredients prevents us from starting if the formula is accurately dosed to deliver desired results. Rococo Revitalize Skin Lightening Cream can be purchased from the manufacturer’s website. A 60ml tub currently retails for $24.90 which is within the standard price range of products such as these. However, with a lack of patented ingredients, this price may not be justified. Furthermore, there are no bulk offers or discount deals available, which may make the sustained use of this product costly. There is a 30-day period in which product may be returned for a refund, however, this only applies to products that are a result of a defective or incorrect order. This does not actually support customers who may not be satisfied with the product’s effectiveness and is way below the market standard. This does not show much confidence in the manufacturer’s perceived efficacy of this product, as they are not willing to back up their claims. Furthermore, there are many customer reviews online that claim that this product was ineffective for them and displayed no visible results. 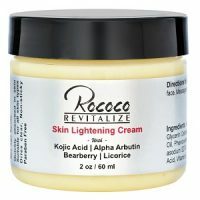 Rococo Revitalize Skin Lightening Cream has a range of ingredients that may support the skin lightening process, however, the lack of patented ingredients may make this product less effective than alternatives on the market. While the price is somewhat affordable, the continual use for minimal efficacy may result in an accumulated cost that may become expensive. Although there is a refund policy, it does not actually back up claims as it doesn’t support customers who may not like the product. These reasons, as well as many negative customer reviews sharing claims of inefficacy, is why we do not recommend this product.